Forests are depleting worldwide -- the State of World's Forests 2001 report by the Food and Agricultural Organisation (fao) states the obvious. But it also goes beyond the obvious in analysing the loss in a fashion that Indian government has found it hard to commit itself to. While plantations might be gaining ground, natural forests are falling prey to increasing mismanagement. The management needs of the North remain vastly different from that of the South where poverty and environment are inextricably linked. But the government policies refuse to look at the evidence on ground. 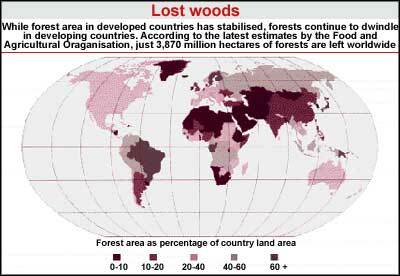 The result -- in India, as in the rest of Asia, natural forests continue to be felled -- legally or illegally.